You can make a donation or take part in an event in memory of someone special via Virgin Money Giving.. Sally Heape raised £515 in memory of her husband, David Heape. 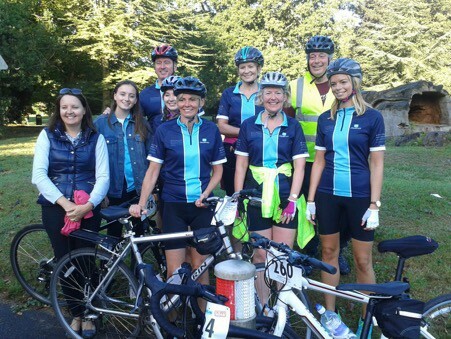 This September I cycled from Woodmansterne to Brighton, with friends and family, in memory of my late husband David Heape. It was an absolutely glorious day and I loved doing it. I felt David was with me as I pedalled through the beautiful Surrey and Sussex countryside on one of his (not racing!) bikes. He would have been proud of us all I’m sure although I know he would have thought my preparations were a little sketchy! Having got such a buzz from it I wondered how we could help others, less fortunate than us, to enjoy cycling and so I did some fundraising for Wheels for Wellbeing. David was always trying to get as many people as possible to cycle and i regret now not sharing his enthusiasm! I got such a buzz from the event and realised what my late husband was talking about when he would say what freedom and exhilaration it gave.